Villa Sanaan is a traditional Bulgarian country house, very suitable for large groups or families with it's own private swimming pool. The house is renovated to be an environmentally friendly home and the essence is the freedom to explore without boundaries. The perfect sea holiday retreat for your mind, your body and your soul. 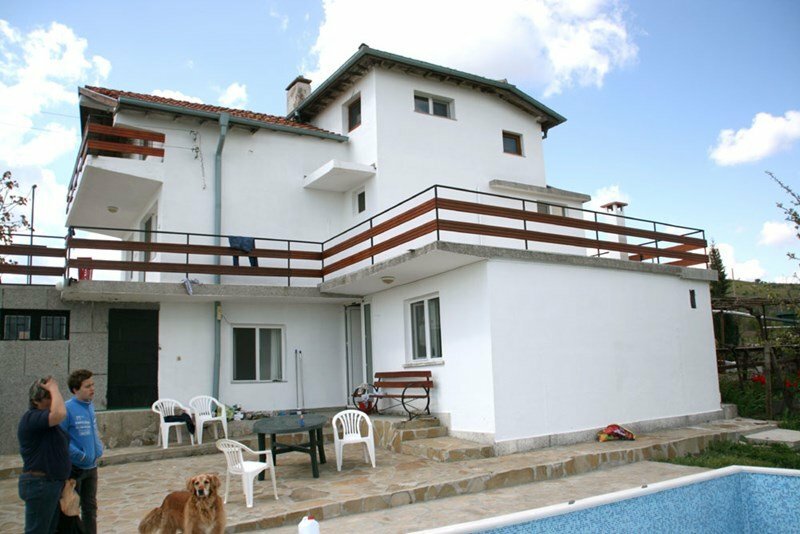 Situated on the hillside overlooking the Bourgas bay with sea and mountain views (we bought the house for the views!! ), and half an hour driving to the sandy beaches of Sunny Beach, Nessebur or Burgas, at the top of the hill yet minutes from the village center of Izvorishte, this villa is a beautiful, tranquil and simple place to relax and de-stress. With secluded gardens, fruit trees and vines and overlooked by no other property, this is an idyllic escape. There is a large sitting room with a television and WIFO comes from there. On the ground floor you further find a small room with a divan bed, and a toilet with a washing machine. On the second floor, still 2 sleeping rooms (you must go through the first one to enter in the second one - this second one has 4 single beds). See pictures... views on Izvorishte (and the storks nest), Burgas, Burgas airport, Pomorie and Black Sea.